Hello readers, here is the continuation of the previous topic, Immunohemolytic anemias. Today we will discuss the next two types, its more like winter special. B) Cold agglutinin type- Cold agglutinin derives their name from the fact that they show maximal activity at temperature lower than normal body temperature. It is present in low titres in healthy individuals. Physiological cold agglutinin develops naturally after birth as a result of change in expression of Red cell antigens and reacts maximally at 4°C. While pathological cold agglutinin maximally reacts at around 28-31° C and tend to occur at very low titres. C - Complement mediated hemolysis. Mechanism- IgM binds to red cell where the temperature may fall below 30°C. It agglutinates red cells, and fixes complement rapidly. 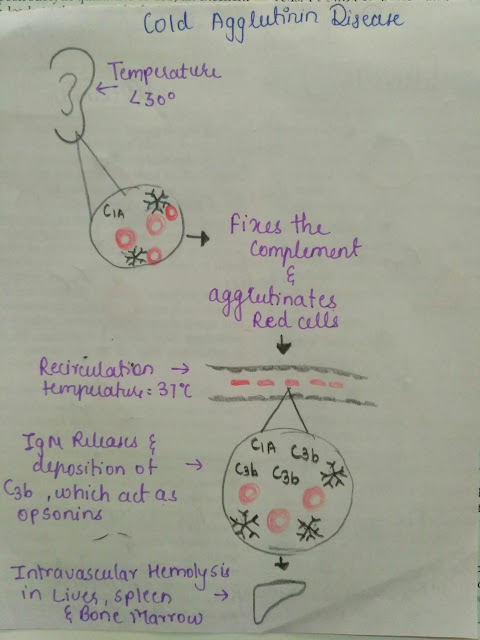 As blood recirculates and warms, IgM is released,but sufficient deposition of complements leads to phagocytosis of affected red cells in spleen, liver, bone marrow. Clinical presentation- Exerts their pathological effects either via hemolysis and red cell destruction in RE system predominantly liver or by vaso occlusion due to agglutination. Raynaud phenomenon in peripheral cold exposed parts. Also known as paroxysmal cold hemoglobinuria. It's a rare fatal disorder causing intravascular hemolysis and hemoglobinuria when auto antibodies binds to P blood group antigens in cool, peripheral regions of body. C- Complement mediated lysis occurs. Symptoms of the patients aggravates on exposure to cold. Winter is coming, we know what's coming with it. Aminoglycoside made easy, simplified and decoded! Nasal spray that prevents suicide. Can virus kill cancer cells ? Pain killer in Human saliva.